Sam Beckett has a date with destiny. Where will he end up next? 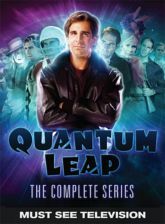 Get ready for the adventure of many lifetimes with the ground-breaking sci-fi classic Quantum Leap. Enjoy all 97 thrilling episodes of this Emmy� Award-winning series. Join Dr. Sam Beckett (Scott Bakula), a time traveler lost in time, who temporarily leaps into the bodies and lives of other people to "put right what once went wrong." Accompanied by Al (Dean Stockwell), a wise-cracking holograph that only Sam can see and hear, Sam twists the hands of fate with each heart-pounding, action-packed adventure in the hopes that his next leap will take him home.